What Day Of The Week Is May 30? 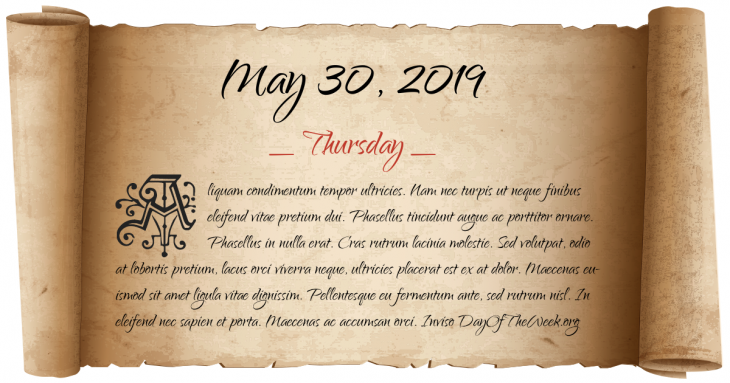 May 30, 2019 is the 150th day of the year 2019 in the Gregorian calendar. There are 215 days remaining until the end of the year. The day of the week is Thursday. Hundred Years’ War: in Rouen, France, 19-year-old Joan of Arc is burned at the stake by an English-dominated tribunal. Because of this the Catholic Church remember this day as the celebration of Saint Joan of Arc. Napoleonic Wars: War of the Sixth Coalition – the Treaty of Paris (1814) is signed returning French borders to their 1792 extent. Napoleon Bonaparte is exiled to Elba. Mariner program: Mariner 9 is launched to map 70% of the surface, and to study temporal changes in the atmosphere and surface, of Mars. Who were born on May 30?